Bellevue police say that an unidentified woman was killed in a pedestrian accident near 124th Ave NE and NE 12th Street on Monday, February 24. 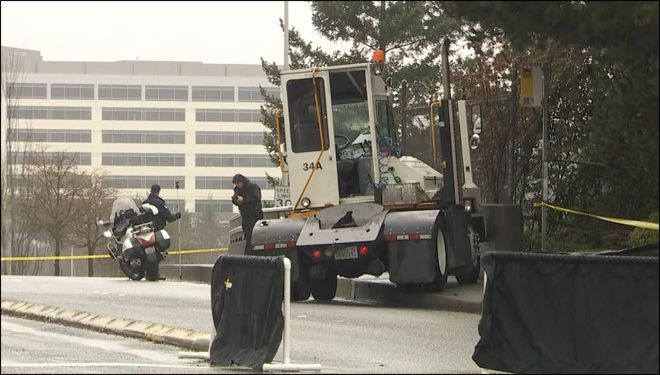 According to police, the woman was crossing 124th Avenue NE as a yard truck was traveling south on 124th Ave NE and preparing to turn west onto Bel-Red Road. The collision occurred around 12:15 p.m. and police say that the woman may have been dragged for sometime after the initial collision. The results of the investigation should reveal whether or not she was crossing the street in a crosswalk, and therefore whether or not she had the right of way at the time. "We don't know if she was in a crosswalk because where she was starting and where she ended up might be two different places," Carla Lafrate said, of Bellevue police. There are several witnesses are that helping put the pieces together of what happened to the pedestrian. Where the woman was hit and found are two different locations on the street. Police found that the driver of the truck was not under the influence, he was in his mid 50’s and from Carnation. The intersection of 124th Avenue NE and Bel-Red Road were closed for many hours to investigate further. The name of the pedestrian killed has not yet been released. In Washington state, drivers are required to yield the right of way to pedestrians who are legally crossing the street - whether that be in a crosswalk or other marked crossing zone. The results of the police investigation into this collision should determine whether or not the woman had the right of way at the time, and therefore whether or not a surviving family member or personal representative may bring a wrongful death lawsuit on her behalf.